Designing and building structures that will withstand the unique challenges that exist in Subsea operations is no easy task. As deepwater wells are drilled to greater depths, engineers are confronted with a new set problems such as water depth, weather conditions, ocean currents, equipment reliability, and well accessibility, to name just a few. 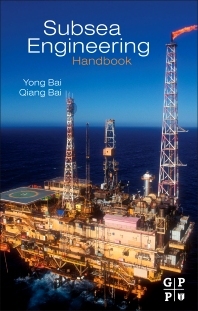 A definitive reference for engineers designing, analyzing and instilling offshore structures, Subsea Structural Engineering Handbook provides an expert guide to the key processes, technologies and equipment that comprise contemporary offshore structures. Written in a clear and easy to understand language, the book is based on the authors 30 years of experience in the design, analysis and instillation of offshore structures. This book answers the above mentioned crucial questions as well as covers the entire spectrum of subjects in the discipline, from route selection and planning to design, construction, installation, materials and corrosion, inspection, welding, repair, risk assessment, and applicable design solutions. It yields a roadmap not only for the subsea engineer but also the project managers, estimators and regulatory personnel hoping to gain an appreciation of the overall issues and directed approaches to subsea engineering design solutions. Dr. Qiang Bai obtained a doctorate for Mechanical Engineering at Kyushu University, Japan in 1995. He has more than 20 years of experience in subsea/offshore engineering including research and engineering execution. He has worked at Kyushu University in Japan, UCLA, OPE, JP Kenny, and Technip. His experience includes various aspects of flow assurance and the design and installation of subsea structures, pipelines and riser systems. Dr. Bai is the coauthor of Subsea Pipelines and Risers. Offshore Pipelines and Risers (OPR) Inc.